Extreme performance without the risks. Purasolve Acti is a safe, sustainable and effective substitute for dangerous solvents. Purasolve Acti is formulated to tackle heavy duty cleaning jobs and loosen hardened hydrocarbons, without damaging most elastomeric, metal and plastic surfaces. Purasolve Acti effectively removes gum and adhesives, silicone, dried lubricants and fuels, paint, graffiti, paraffin, wax, urethane sealants, and soy and water based inks. Always test the solution on a small patch before use. 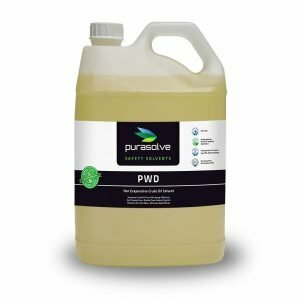 Use Purasolve Acti full strength to loosed both organic and inorganic soiling including hardened hydrocarbons. Purasolve Acti is low-foaming and free rinsing in hot and cold water. Residual solvent acts as a rust inhibitor and natural lubricant. Diluted with water or Triple7 Colloidal Concentrate, the product becomes more of a release agent and less of a solvent. Purasolve Acti has been specially designed to replace hazardous products without changing current equipment or procedures. Simply substitute Purasolve Acti for industrial solvents containing dangerous and harmful chemicals. Purasolve Acti may be used as a co-solvent or solvent additive in non-ionic surfactant solutions for heavy-duty degreasing. Purasolve Acti may be sprayed on or applied with a cloth. Depending on the level of soiling, allow the product to dwell, then simply wipe from the cleaning surface. The product is re-usable for several weeks in conventional solvent recovery machines, ultrasonic degreasers and hand operations. Purasolve Acti will melt virgin acrylic and should not be exposed to acrylic resins. 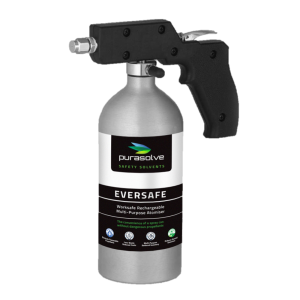 Purasolve Acti has no HazChem rating and is classed as non-hazardous according to the criteria of NOHSC and Worksafe Australia. It does not contain Petroleum Distillates, Glycol Ethers, Terpenes, Synthetics, Builders and Reagents, and Caustics. Purasolve Acti is not classified as a dangerous according to the Australian Dangerous Goods Code for transport. It is non-reactive and storage stable. 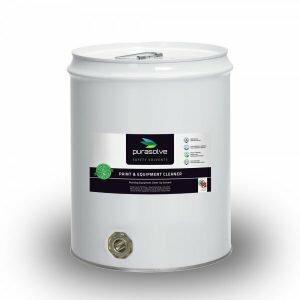 Purasolve Acti is a 100% readily biodegradable solvent, derived form renewable resources. The product is re-usable for several weeks, reducing waste. Once expended Purasolve Acti is safe for landfill disposal. Purasolve Acti is a low evaporation product, and does not contain ozone depleting chemicals.